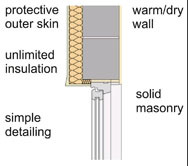 The below descriptions are ECBC recommended thermal mass materials/construction to achieve ECBC recommended U-factor in hot and dry climate. 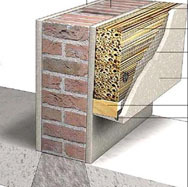 Mass single Wall: Thermal insulation plays an important role in reducing the conductance or U value (W//m2K) of walls. Insulation should always be placed on the external side of the surface. In hot & dry climate, the advantages of placing insulation on the external side of wall composition is that it does not allow the external heat gain or heat loss from the building enabling thermal management of the building. Air-conditioning costs are considerably higher than heating so external wall insulation works equally as well, saving energy costs to cool as well as heat buildings. Thus Life Cycle Cost (LCC) Analysis of ECBC wall vs. Base case with Conventional wall was carried for WWR 10 %. 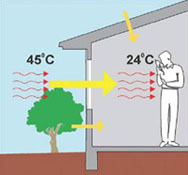 The maximum U-factor in Day use building is 0.409 (W/m2-ºC) and 24-Hour building is 0.261 (W/m2-ºC) respectively for Hot and dry climate.